Say hello to Rogallo FlightLog. 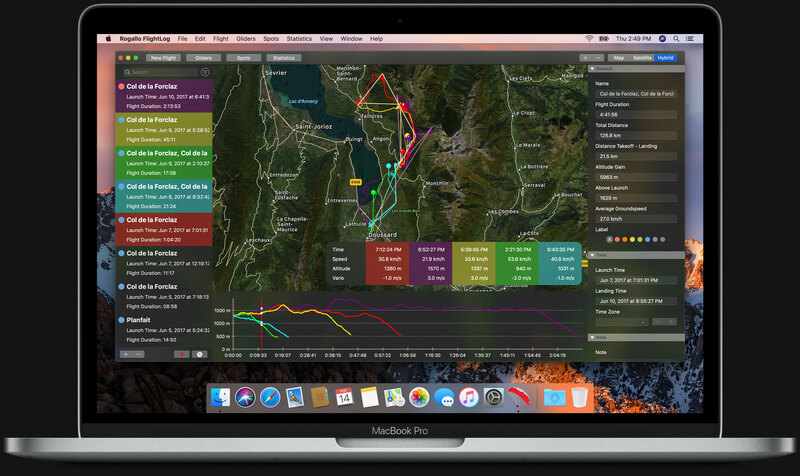 The best Paragliding Logbook App for Mac. Rogallo FlightLog lets you analyse your tracks in detail. It shows you all the vital information about your flight. This includes duration, XC score, maximum climb and many more. Also, it visualizes your flight track on a map. In the map module you can even choose to overlay several tracks in order to compare them. This will help you understand where you can improove your flying. You can choose from many different sources when importing new flights into Rogallo FlightLog. Flights recorded via Rogallo BlackBox for iPhone will immediatelly be synced to your Database after landing. Or you can import flights via USB from Flymaster, Skytraxx and Flytec devices. In addition you can choose to import tracks stored in IGC or GPX file format. 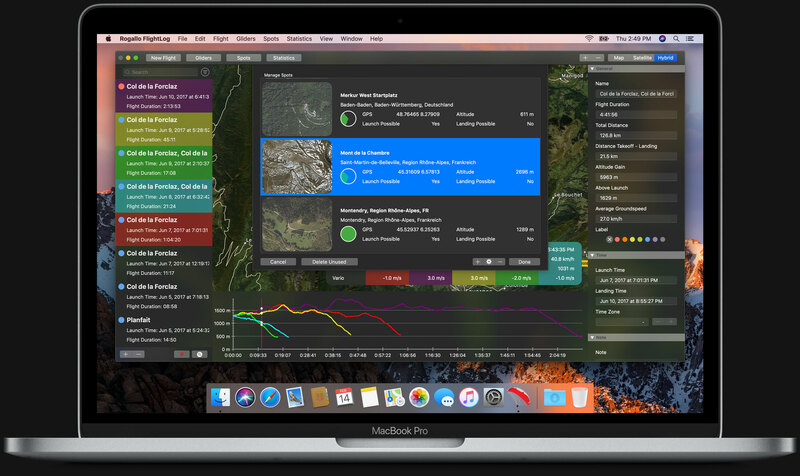 Rogallo FlightLog will automatically keep a database of all your launch and landing spots. This is especially useful when searching or filtering your flights. Also it helps you remember what spots are flyable in which wind direction. 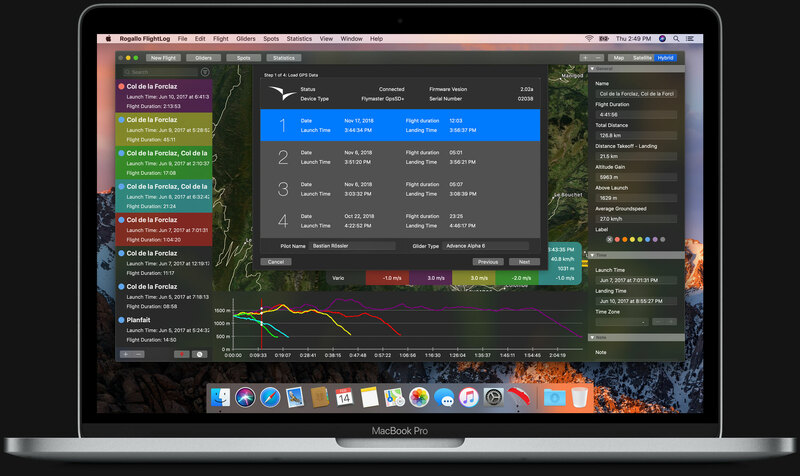 You can use Rogallo FlightLog in order to manage your gliders and to keep track of how many hours of airtime you have flown per glider. This will also help you to ensure you never forget to get your glider checked in time before the next due date. The statistics module is very handy when analysing your flying career. It can provide detailed information structured by year or by month that will help you understand your development as a pilot. Wether you import your flights from Rogallo BlackBox via iCloud, from your Vario via USB or via IGC File. Rogallo FlightLog has got you covered. Upload your flights to your favorite XC Servers right from within Rogallo FlightLog. Review your flights in 3D. You can export tracks as Goole Earth (KML) files easily and then review and relive your flights in 3D. 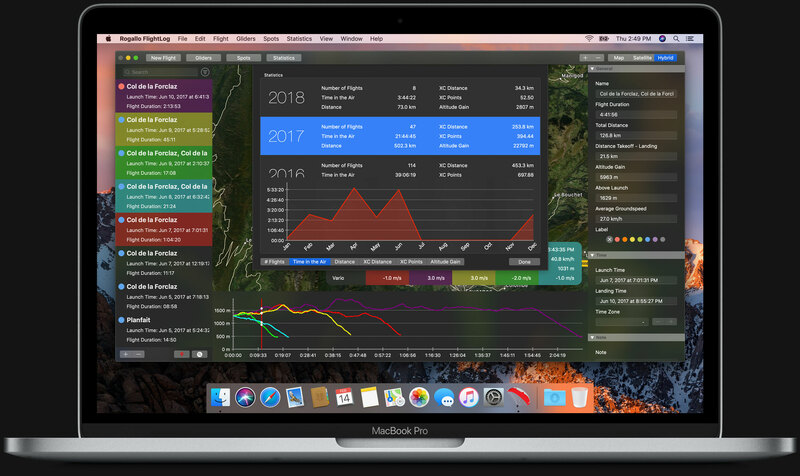 Rogallo FlightLog for Mac and Rogallo BlackBox for iPhone always keep your flights in sync between your devices. See Rogallo FlightLog in Action. 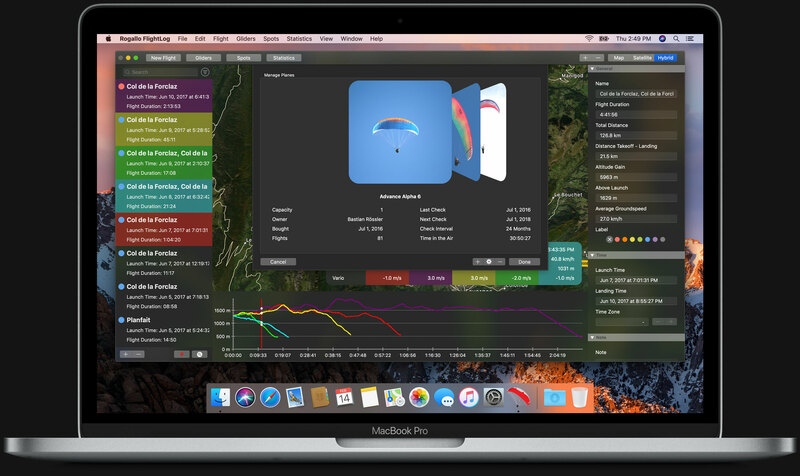 Get started using the best paragliding App on your Mac by downloading Rogallo FlightLog from the Mac App Store.